** 2018 KEYSTONE PASSPORT 3320BH TRAVEL TRAILER ** (3) SLIDES ** ULTRA LITE ** WEIGHS ONLY 6586LBS! ** SLEEPS (10) ** KITCHEN SLIDE ** ISLAND BAR ** ** EXTERIOR KITCHEN ** OUTSIDE SPEAKERS ** ** NATIONWIDE FINANCING AND DELIVERY AVAILABLE ** NO HIDDEN FEES ** WWW.RV007.COM ** 1-888-299-8565 ** PASSPORTS NEWEST TRIPLE SLIDE FLOOR PLAN!! ** Introducing the brand new 2018 Keystone Passport 3320BH ultra lite travel trailer with not only a huge super slide in the living area and a bunk slide in the kids room, this new 3320BH has a kitchen slide that Mom is absolutely going to fall in love with! The new Passports are really nice travel trailers. They now have the White exterior fiberglass, they have a new style linoleum, a heated and covered under belly and more! I really like this new exterior, it looks good! First off, the Passports are true ultra light RV&apos;s. They have aluminum framed sidewalls, fronts and backs and the fiberglass exterior. This RV has triple slides and weighs only 6,586 lbs. which is perfect for and 1/2 ton truck or SUV. If you want living room space, and extra storage, this Passport 3320BH definitely has it and for quality, price and weight, you can&apos;t beat a Passport! The 3320BH floor plan has a walk around front queen bed with underneath storage, the entertainment center is located between the bunk room and main living area and has an AM/FM/CD/DVD player and an upgraded 32" LCD TV. It has a super slide on the off door side that has a King U-shaped dinette and a hide-a-bed jack knife sleeper sofa and across from that is a full kitchen with a (3) burner stove top, an oven, a microwave oven and a double door refer, and again, it has the kitchen Island. It also has a very private side aisle bathroom with a NEO angled shower with a glass surround, sink with vanity and medicine cabinet and toilet all in one room. In the rear of the coach on the off door side is the bunk slide with double futons on the bottom and a flip up bunk over top. Across from that is a huge wardrobe for the kids clothes and above the wardrobe is another bunk bed, so you can actually sleep up to (10) people in this RV! On the outside of the RV where the kids wardrobe is, you&apos;ll find the huge exterior kitchen that Dad will love! Again, this is a very nice floor plan with a ton of features for the whole family! Here&apos;s a list of options ordered on this RV. The interior color is Driftwood. It has the all new white fiberglass exterior, it has the exterior package which includes a (6) gallon gas/electric DSI hot water heater, tinted safety glass windows, outside speakers, a power awning, TV antenna with booster, (4) stab jacks, an enclosed underbelly, an exterior shower, a spare tire with carrier, a folding assist handle at the entry door, EZ lube hubs, a front diamond plated rock guard, and an outside camp kitchen!. It also has the Interior package which includes the pull down privacy shades, an AM/FM/CD/DVD sound system, an upgraded LCD TV, a porcelain foot flush toilet, a skylight in the bathroom, raised panel cabinet doors, a double door refer, a 15K BTU ducted roof A/C, a microwave oven, a (3) burner stove top with oven, it has a ducted furnace, and a Tri Fold sleeper sofa. If you have any questions, please feel free to give us a call at 888-299-8565 and ask for sales. 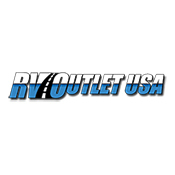 You can also visit our website at RV007(dot)com and our email addresses rvoutletusa@yahoo. Give us a call, we would love the chance to earn your business and please keep in mind, we have NO DOC, PREP, PDI, TRANSPORT or any other fees like the larger chain stores have! We also offer our customers huge discounts on weight distribution kits, parts and accessories! Give us a call, we&apos;d love the chance to earn your business!